“Wow – this place is truly beautiful”, I said to myself as I stared dreamingly at the lush mountains surrounding Luang Prabang from the airplane window. My God, finally a town with beautiful houses, I thought as I biked from my guesthouse to the centre of Luang Prabang, taking in the fabulous combination of colonial houses built in wood and the ever-present Mekong river with its unending flow of chocolate milk. I wonder if I’ll like this even better than Thailand? I thought. Laos was the third SE country I was setting foot in, after some time in Malaysia’s Kuala Lumpur and quite a few days on and off the beaten track in Thailand. Before arriving to Luangprabang by air, I was imagining an essentially rural and quiet country. On top of beautiful temples and stunning waterfalls, I was looking forward to decent coffee and French-style baguettes. Can I get any better? A fantastic cafe in the historical city. Well, it turns out, a week later I couldn’t be happier to be back in Thailand, eating omelette in Nong Khai’s lively day market, only a few hours before catching my train back to Bangkok. What follows are some tentative impressions about Laos. I know that one week in the country will not do it justice -especially covering two well-trodden destinations such as Luang Prabang and Vang Vieng- and I definitely look forward to being back and truly enjoying travel in this beautiful country. Impression one. 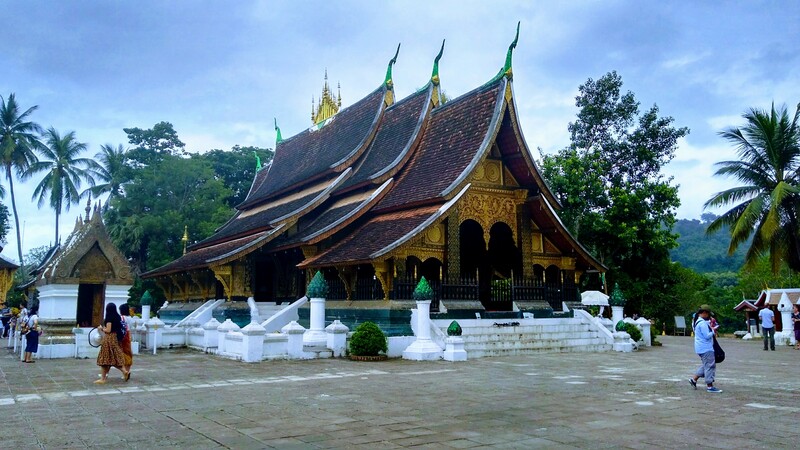 Luang Prabang sure is beautiful, but very soon it feels….well….bland. The views are absolutely memorable: the temples, the houses, the brown Mekong in wet season. I hated the night market, though, which is basically a tourist trap – quiet and targeted at foreigners looking for souvenirs. That’s it – historical LP felt like a stage for backpackers and eco-minded tourists to shoot their photos and videos for Instagram. And where are the locals? I kept thinking. Still, the combination of Beer Lao and views are great for unwinding, meeting other (farang) travelers, and planning future adventures. Impression two: VangVieng is weird, weird, weird…. Fun, scenic but not really worth going back. But hey – been there, done that…well, not THAT. Still – I found it surprisingly easy to write about my three days there. Impression three: In Laos, the road is life. Really – I haven´t seen so much so different going on on roads paved or unpaved, as when I mountain biked in the Vang Vieng area. Understandably, people (including very young children) will happily use it to get from point A to point B in town, hence avoiding other marshy or puddle-rid routes during the wet season. But the animals – really, I never so many different animals walk on, or crossing, the road on a single day: chicken, ducks, pigs, cows, oxen, water buffalos, stray dogs. Come to think of it, when you put them all together the sight resembled a page from a storybook by Dr Seuss. Impression four. This beautiful country and its sights are well worth your money, but sometimes it’s hard to avoid feeling scammed. Or, better, that there’s a fee or a toll for anything you may want to do. I’ve written extensively about that here. Impression five: the food is bland. Laotian dishes look like Thai dishes mainly Isaan Thai (spicy sausage, som tam, larb moo..) but they pale in comparison, somehow lacking in freshness and taste. Let me put it another way. Where Thai food conveys joie de vivre and sanuk mak mak, Laotian food will fill your stomach, but not your memories. Impression six: people don’t easily smile. This strikes you more when coming from Thailand, a.k.a The Land of Smiles. And it wasn’t even me who noticed – it was Ek, my indefatigable travel companion. “Sabaidee, no smile; Kop jai, no smile” he commented, with a frown. “Mai khrap”, he said. “Not annoyed. But I’m confused”. Once I badly needed a toilet, but was refused entrance at the public toilets just off the night market at Luang Prabang. The reason? I had no Lao Kip for the small entrance fee. The teenage girl at the desk would not relent. “No Thai Baht, no American dollar, only Lao Kip”, she clarified with a stern face. Hopeless, I retreated, and looked for the closest hideout for a quick pee. My first week in Laos was, let’s say, satisfactory. I saw beautiful sights, both natural and human-made. I had fun enjoying outdoor activities with my friend Ek. However, now I know that, if I go back to Laos, I will pursue a more adventurous travel style. This means getting off the beaten track – really, to places where no one will offer you tours or speak a word of English. And hey, spending a week in Laos made me realize one of the things I love so much about Thailand. In most tourist destinations -that’s beaches, national parks, markets, bars…- there’ll be Thais sharing the space with you. With their irresistible smiles and their bottles of SamSom and sodas. With their shyness when it comes to speaking English, but their curiosity to make sense of you or, at least, innocently poke fun at you. Not that this is the fault of Laotians, of course. Laos seems to be, in many ways, thirty years behind Thailand, where there exists a middle class of sorts with enough time and money to enjoy their own country in a similar way a farang would. Let’s hope that moment come soon.